Despite poor weather, West Michigan Offshore members who participated in Rock The Coast had a great time. Throughout the past 31 days, my friend—I think it’s safe to call him that after a few years of working closely together—Pete Boden has covered a lot of miles traveling from races to poker runs to fun runs and more, and has a lot of photographs stored on his computer to prove it. Between Sarasota, Fla., Nashville, Tenn., and Boyne City, Mich., Boden and his RV have been to several of the most unique waterways in the country in July, and he’s had a ton of fun meeting new people and taking pictures of their amazing boats. Thanks to Boden’s efforts, I thought it would be cool to go back through his images and pull out my favorites from five different events he covered last month. Going in the opposite direction of my fellow columnist Matt Trulio’s “Peering Into August” story from yesterday, I decided to reflect on the last month—rather than look ahead—and highlight the work of speedonthewater.com’s chief photographer. 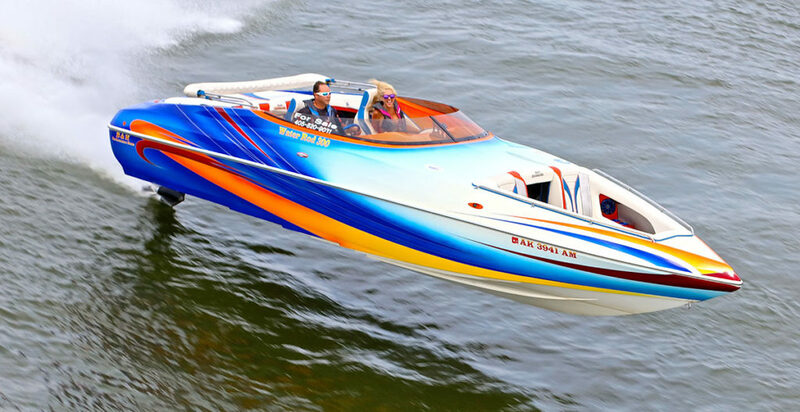 After traveling to the Tickfaw 200 Poker Run in Louisiana in May as well events in Missouri, Wisconsin and Jacksonville, Fla., in June, Boden started close to home in Sarasota, Fla., on the first day of July for the annual Sarasota Powerboat Grand Prix. 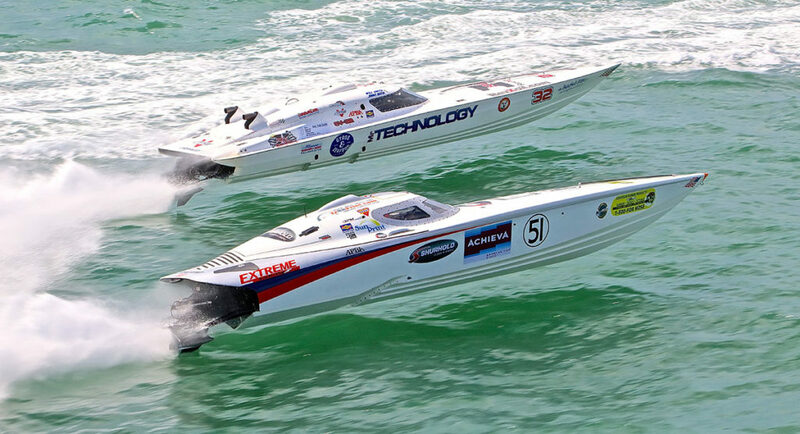 In the Super Vee Lite class, Mr. Technology and Sun Print raced deck to deck in Florida during the Sarasota Powerboat Grand Prix. From there he took off in time to get to Michigan for the 15th annual Boyne Thunder Poker Run, then he hung out in Michigan for a few days and worked his way down to Grand Haven to cover the West Michigan Offshore Rock the Coast fun run, which unfortunately was plagued by some poor weather that forced event organizers to call off the helicopter photo shoot planned for that day. While the water on Lake Michigan during the Boyne Thunder Poker Run in Michigan was fairly calm, some boats, such as this 36-foot Sunsation, found some cruiser wakes to launch off. Of course Boden made the best of an unfavorable situation and still managed to grab several cool shots of the WMO participants in the club’s third Rock the Coast event. After Rock the Coast, the ace photographer traveled to Nashville, Tenn., for the first time to cover the Old Hickory Fun Run, Bar Crawl and Raft-Up during the final weekend of July. Boden had a great time at the sixth annual event organized by the Tennessee Powerboat Club and vows to return next year to capture some more beautiful images from the super fun event on Old Hickory Lake. Steve Grier and Christy Wilder were all smiles as they flew their B&H Performance Boats Water Rod 300 during the Old Hickory Fun Run, Bar Crawl and Raft Up. Unfortunately he couldn’t stick around too long and enjoy the Saturday evening awards party, as he was back on the road en route to St. Clair, Mich., so he could cover Sunday’s Offshore Powerboat Association-sanctioned St. Clair River Classic event. 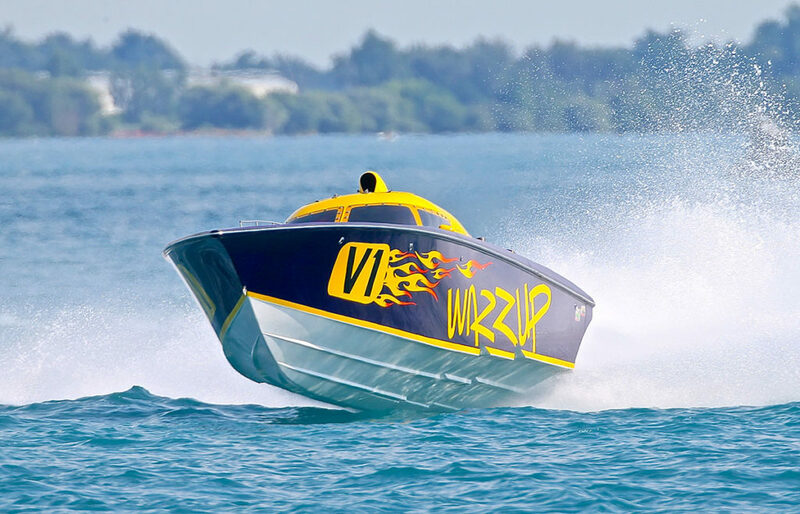 Wazzup bested Strictly Business in Class 3 during the OPA St. Clair River Classic. While I wanted to keep this list focused on five cool shots from Boden, I should point out that the photographer also hit the first Race World Offshore event in Mentor, Ohio, on the Sunday after Rock the Coast—proving that he is a bona fide road warrior on a mission to capture as many cool shots as possible. All photos by Pete Boden/Shoot 2 Thrill Pix.